7. Based on requests these presentations can be tailor-made. - Are there still "white spots" left? Photo. The Three Windows from Macchu Piccu in Peru. The whole Peru is natural wonder and great treasures. Continuously new discoveries change the history.  What will be the next discoveries and big adventures in the future?  What crazy things do the tourists ask about?  How to become a nice and well informed tourist? How to turn your dreams in to reality?  Why build a brand?  Opportunities on internet - new business?  Who will be the winners in the future? Hear about Stein Morten Lund`s unique adventures based on displaying of photos, video films, artefacts and traditional weapon. 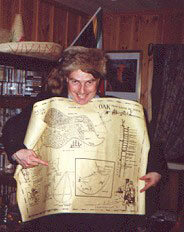 An adventurer from Peer Gynt`s fantasy full kingdom, Vinstra (Gudbrandsdalen) in Norway. He has been travelling around the world since 1986. In 1999 a national Norwegian newspaper, Dagbladet, covered 7 pages about his unique adventures. Photo. 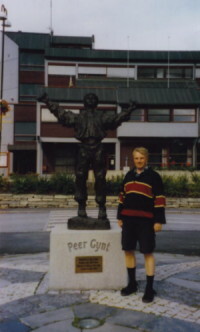 Stein Morten Lund stands next to a statue of Peer Gynt. They are both from Vinstra, Gudbrandsdalen in Norway. Another thing they have in common: adventure travelling and telling amazing stories. Stein Morten spends much of the time inspiring others to travel around the world. He is an editor of the global travel guide Travel Explorations (www.TravelExplorations.com). During years he has also written more than 300 articles both on Norwegian and English. Each year he shows photos and video films from his last tours.  Big discount to schools etc.  Cover of travel costs outside Oslo - based on agreement. 4. Wild, beautiful Amazon (Per Henriksen) 1 - 1,5 hour. The Amazon is the biggest rainforest in the world. Here live about 200 Indian tribes. Many of them have first the latter years got in touch with the modern world. Several tribes still live as they probably did in the Stone Age, but it is just a matter of time before they will be a part of the world we know. Photo. One man living in the Amazon jungle playing a kind of fluit. This photo and many more will be displayed in Per Henriksen`s multimedia show. Join Per Henriksen on an exciting tour down the Amazon River, where he visits two Indian tribes! Experience their hard daily life, threaten religion and fight against logging of their rainforest and unknown diseases that are brought by the white intruders. Anyway the tribes look optimistic to the future. In his presentation he will display Indians bows, arrows and head ornament. An Norwegian journalist, photograph and editor of the internet portal Reiseliv - "Travel Life" (www.Reiseliv.no ). He has travelled in most ways and been to most places. One of his most interesting adventures was trekking in the Amazon jungle in South America. Per is a great adventurer from Norway always ready for new challenges! Deep in the jungle Per met Indians who have retained their traditional lifestyle. Based on his adventures there he has worked out an unique multimedia show. His presentation gives a good insight in the Indians life and culture. Per Henriksen is an Norwegian journalist, photograph and editor of the Internet portal Reiseliv - "Travel Life" (www.Reiseliv.no). He has toured around in the US many times. Several times he has attended several "re-enactments", realistic reconstructions of battles from the civil war in the US in the period 1861 - 1865. The fight against slavery was the biggest mare in the American history. Trough a fascinated multimedia show it's possible to experience what happened for near 150 years ago, and all the suffering and pain. US` archives contains many thousands historical letters written by young soldiers. These letters are among the most important sources which give insight to young ones life in the war, and therefore the multimedia show is given the title "Just before the Battle, Mother". "Just before the Battle, Mother" is put together by new photos from the reconstruction where up to 10,000 actors play each role in clothes and equipment from the period. The show displays new colourful slides and original photos from 1861 - 1865 (two views display the slides on a big screen 3,5 X 2,5 metres, music and song from the civil war, sound and speaking. The show has been performed for historical organisations as Rotary, Son of Norway and many others.